Maximum size: 7 mm (Gosliner, 1980). Identification: This aeolid has annulate rhinophores similar to those of Tenellia sp. #22 but has fewer and thicker cerata. White pigment is concentrated in well-defined patches on the central notum and cerata. 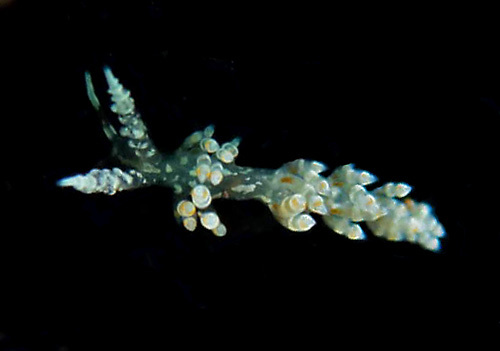 The cephalic tentacles have solid white tips and the orange basal spots on the cerata appear more dorsal than central (unlike those of Tenellia sp. #22). Natural history: Tenellia pinnifera is a rare species known on Maui from only four animals found in moderately protected to moderately exposed rocky habitats at depths of < 1 to 1.5 m (< 3 to 5 ft). One found on Oahu in 1973 by Terry Gosliner was in a highly protected to protected area (Kaneohe Bay). Gosliner (1980) and Kay (1979) reported that the Kaneohe Bay animal was found in association with the hydroid Halopteris diaphana. Distribution: Maui and Oahu: also found in Japan and French Polynesia. Taxonomic notes: It was first recorded in Hawaii from Kaneohe Bay, Oahu by Terry Gosliner in Aug. 1973 and is listed as Cuthona pinnifera in Gosliner, 1980 and Kay, 1979.